I met and talked with Sultan Abdullah quite a few times including at his home, the Sultan Abdul Aziz Shah Palace in Kuantan and found him to be genuinely nice and people-friendly. I'm quite sure he will be a good Agong. That's because I personally took the picture. It was at the Temerloh R&R area of the East Coast Highway near the end of the major flood of 2014, which devastated Pahang and the other East Coast states. The highway at that time was cut off by flood water along with many other roads in the state. I was doing my bit of volunteer works at the R&R when Sultan Abdullah landed his helicopter to visit flood victims from nearby villages sheltered there. It so happened that a journalist friend was there too and I told him to tell Sultan Abdullah that the flood victims were not getting food supply and other assistance from the relief agencies because the R&R area was not a designated flood evacuation centre. 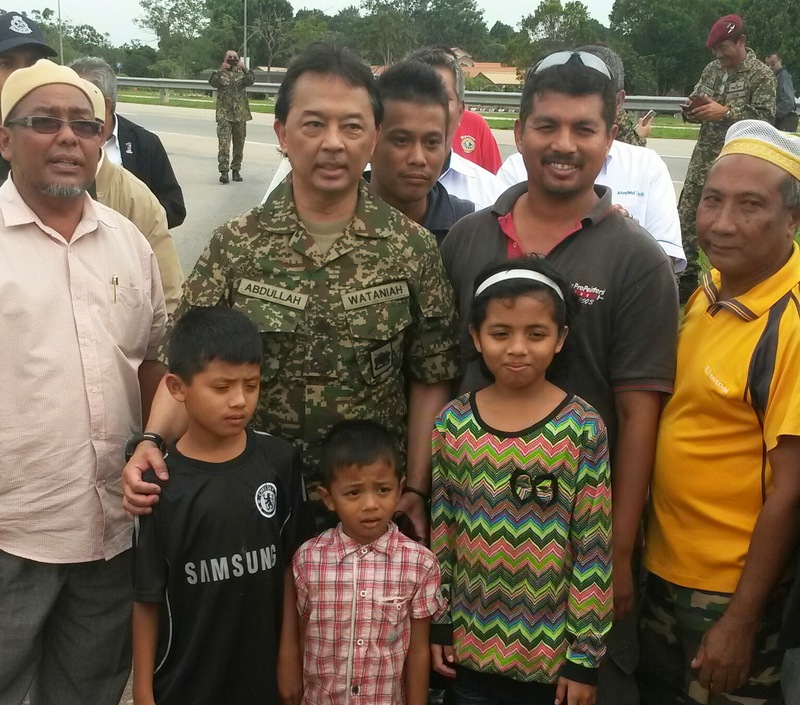 They were instead getting limited help from some kind souls from the nearby Jengka Felda settlements. Sultan Abdullah was visibly shocked upon learning this and immediately told the officials who were with him to make the arrangement to provide necessary assistance for the people there. He looked very natural with the people and after giving them some personal contributions didn't mind me asking him to pose for the picture. If you look carefully at the picture, you would notice that Sultan Abdullah have that tired look on his face. That's because he had been flying to all the hot spots in the state almost daily ever since the devastating floods hit Pahang. I believe that he genuinely care for the people and for that he is generally popular among them. I gave the picture to my journalist friend and if I'm not mistaken it was published in one of the newspapers. And this is a video sent to me by my best friend who lives near his palace as Sultan Abdullah's convoy passed-by the neighbourhood to the Kuantan Airport this morning. And this one is when he boarded the plane to KL with his wife Tunku Azizah. Permaisuri yang sungguh dihormati. Most likeable Queen with Tuanku besides her...a well mannered King. Long Live Our King. Hope his knights take good care of our King. Aiseymen..nampak kuah tumpah atas simen! Got 'cool Agong'...'hot Agong.' How's that? Don't tell me, the previous one is so hot! Better be careful la Annie when 'sembang'about those Kings and their kerabat... Hot or cool...you must know about the makno of 'mencemar Duli' first. If you rasa 'blur' tontang maknonyo...den advise you.."minum coolblog" is more cool dan sojuk ati..! The only state ruler, and now a King who is gracious enough to give impromptu interview to the media candidly whenever is out and about. Just like his father. Down to earth and approacheble. Just like anyone else who is being approached by the media, if the media saw him and threw some questions, he would gladly answering them without much hassle from his entoutage. He would make himself available if the media want to ask more questions. No protocol whatsoever.. There is no state ruler in Malaysia behaving like that. The seem aloof and exclusive. Unapproachable. Not as cool and as candid as Sultan Abdullah. Daulat Tuanku!! !..